The spot forex market is highly leveraged, volatile and trades round the clock from early Monday morning to late Friday night making it an ideal instrument for spread betting. The fact that forex rates are quoted continuously round the clock means that there will always be ample trading opportunities and it will easy to get in or out whenever you need to. It is sometimes confusing to those who do not trade to talk about Forex spreadbetting or forex spread trading as it is sometimes called. Most people understand what Forex trading is even if they have not done it. But they understand that foreign exchange trading is already one of the highly leveraged ways to make money through financial trading. Yet spread betting is another way to leverage your money, and adding another layer to the trading does not seem to be relevant. Spreadbetting on the Forex market actually makes good sense, and provides more convenience than trading the Forex market directly. The Forex market trades with ‘lots’ of 100,000 currency units, and also with smaller ‘mini-lots’ one-tenth of the size specially created for individual traders. The margin required to trade on Forex is small, perhaps 100:1, so with a relatively modest investment the trader can profit or lose by how much 100,000 units change compared to the second currency. If you choose to spread bet on the Forex, you have much greater flexibility. Essentially, with spread betting you can bet any amount you want on each point change in an index or, in this case, a currency exchange rate. 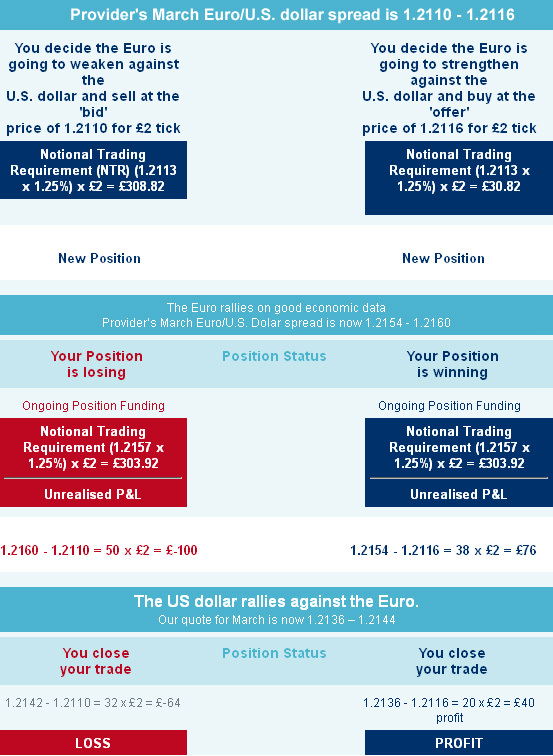 Even when you apply spread betting to the Forex market, there is no such thing as a lot. Regarding the trading costs, these are usually similar whether you spread bet or deal directly on the Forex market. In fact, the spread bets will closely follow the underlying spot rates which makes them cheap and easy to trade. Spreadbetting has the cost built-in to the spread, which means that you buy and sell at slightly different prices. The price has to change in your favour by the spread amount before you will have broken even. Forex has exactly the same system, with a spread between buying and selling prices, and the spreads are usually the same amount. With spread betting, the size of the spreads is dependent on the spread betting broker, and not universal, as with Forex, but as they are normally the same, this is not an issue. Providers will give you access to all the major global currency pairs. Normally they will offer both quarterly and daily contracts with quite competitive spreads. As with other forms of spread betting, forex trading requires you to manage risks carefully using a proper risk management strategy, especially so since the currency markets can be very volatile. You should establish entry and exit levels including stop levels before you even place a spread bet on a currency pair. This way, you don’t let emotions interfere with your decision-making process – leaving you free to keep up with any market-moving developments as and when they happen. Apart from the better flexibility for trading currencies using spread betting rather than the conventional Forex market, there is one very important distinction that makes Forex spread betting the winner, hands down, and that is the tax situation in the UK. The situation with a regular Forex trading account can be interpreted two different ways. If you are classified as a “professional speculator” then you pay income tax on your profits, because it is classified as your job. The more common situation is that your trading profits count as capital gains, and you pay tax according to that. If you trade on the currency markets using Forex spread betting then you escape these taxes. Profits from betting are tax-free in the UK. Gambling gains are not taxed, whereas investment gains are. If you plan to do much currency trading, and you are UK resident, this fact alone makes Forex spreadbetting a much better prospect than going through the usual currency dealers. Given the increasing popularity of currency trading, Forex spread betting is growing rapidly in the UK. It’s safe to say that if something comes with a government-mandated warning label on it, there is grounds for caution. This applies to smoking cigarettes just as it applies to taking prescription drugs. It also applies to trading foreign currency exchange via an online forex broker. With the explosion in the number of online forex trading brokers and the increase in public awareness of retail forex investing, this type of trading has become a very lucrative market. It has also become an easy way for those without a background in financial investing to lose a ton of money in a short amount of time. In this article, I will outline how beginning forex traders can start investing in this lucrative but high risk financial market in a measured, controlled and incremental manner in order to properly learn its ins and outs, minimize risk and (hopefully) eventually learn to profit. Almost all foreign exchange brokers offer new traders the ability to open a forex trading demo account with anywhere from $5,000 to $100,000 in virtual money in the account balance in order to allow them to test their trading platforms and become familiar with forex trading in general. Signing up for and using a forex trading demo account is a great way to start your forex journey. Trading using virtual money enables one to test out various forex trading strategies, make mistakes without having to pay a financial price and, in general, helps one understand what one does and does not like about a specific forex broker or platform before any financial commitment is made. Moreover, along with a demo forex account, top forex brokers typically offer an assortment of educational articles, online forex news, informative videos and other material to help elucidate the sometimes murky world of online forex trading. These can really help new traders understand more complicated forex concepts like OCO and GTC orders, trailing stops, margin requirements, rollover charges and scalping and hedging restrictions. Once one has become sufficiently aware of the potential pitfalls of trading these highly volatile financial instruments, it’s a good idea to subscribe to a free forex signals service and begin trading according to signals in order to familiarize one’s self with the various types of orders and trades investors usually execute when trading forex. Most signals services are not free and require a sizable monthly fee in order to receive them. However, almost all of these services offer some form of free trial in order for the subscriber to verify that their signals are in fact reliable and often result in a profit. Depending upon the forex trading broker with whom one has registered an account, they may offer forex signals as well. This often depends upon the type of account one has created with them (micro, mini, standard, etc.). After having executed forex trades based on reputable forex signals, a new trader will better understand the when, what, where and why of forex trading. He or she will have a deeper understanding of what types of chart patterns typically generate a buy or sell signal, how stop loss and profit limit numbers are usually calculated and so forth. Moreover, one hopes that the forex signals will have also allowed one to earn a profit (albeit virtual) while trading with the demo account. One should only trade forex for real money after one has successfully generated a profit using a forex demo account. Only then is one truly equipped with the understanding and skills necessary to confront the USD, EUR and others on the forex battlefield. I recommend starting to trade forex for real money by making the minimum deposit necessary with the foreign exchange broker one has selected. Typically, the minimum deposits range from $50 to $200 depending upon the broker. Although this may not seem like enough money to be able to turn a profit, since most forex brokers offer leverage from 50:1 to 400:1, one only needs to start with a small deposit in order to test the waters and see if one is able to turn a profit while trading with real money. Be aware that trading with real money is NOT the same as trading with a forex demo account. The losses are real losses and so you will not react the same you did when you lost money while trading with a demo account. Moreover, the response time when executing an order or closing a position may vary between the time it took with the demo account and the time it takes with your real trading account. If you’re able to rack up some earnings with the micro or mini account, it may be worth it to upgrade to a standard account, which often offers many more amenities including forex signals, a personal account manager and lower spreads. Trading forex profitably is a nerve-crunching battle between the investor and the financial markets and thus should only be attempted by those prepared for the challenges it brings with it. In order to properly trade forex, it’s helpful to begin by creating a free demo account, receiving and trading according to forex signals and then, if warranted, trading using a micro or mini forex trading account. If one is determined enough, it’s definitely possible to profit from this lucrative market, but it takes the right preparation first.